How full is too full? One of the most common answers given to this question is the “80 percent rule,” which says a church is too full when average attendance exceeds 80 percent of sanctuary seating. Like so many bits of church-consulting wisdom, this one is founded on a great deal of experience, but little formal research. When average annual worship attendance reaches 80 percent of the comfortable seating capacity of the worship room, crowding becomes a serious growth-limiting factor. 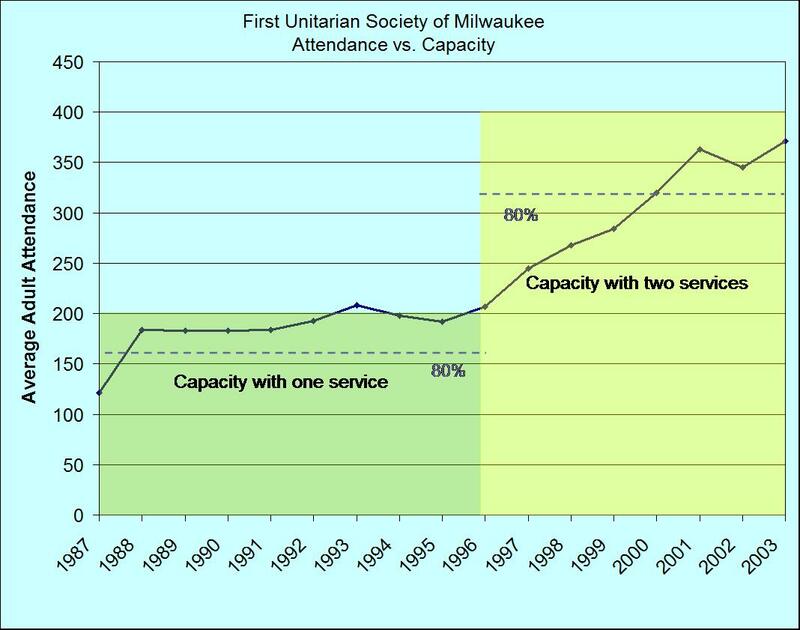 The First Unitarian Society of Milwaukee, with whom I recently consulted about their strategic planning process, provides a good example of the 80 percent rule. Between 1987 and 1996, the church offered only one service. Attendance rose sharply between 1987 and 1988, but quickly leveled off after exceeding the 80 percent capacity mark (calculated based on 30 inches per person). Although small increases were seen after that, First Unitarian did not see significant gains again until it added a second service. After considering this history, the strategic planning team proposed adding yet another service. But success stories like this only prove that the 80 percent rule sometimes applies. Congregations that approach the 80 percent level usually face other simultaneous growth barriers: difficulty organizing for effective ministry to larger numbers; indifference or outright opposition to growth; or other physical barriers like limited parking, lack of visibility, or a location that no longer supports the congregation’s demographic mix. So it is difficult to measure how much difference sanctuary crowding actually makes. With Alban Institute researcher Marlis McCollum, I have been thinking about ways the 80 percent rule could be verified and refined. For those interested in the details, I recommend Marlis’ article in the upcoming Winter 2004 Congregations. For now, here’s an invitation: I am looking for examples of congregations whose average attendance has been at more than 80 percent capacity for more than a year. If you know of such a congregation, please send an e-mail to me with the full name of the church and the e-mail address of someone I can contact there, and I’ll be in touch. I will collect information and report back in a future issue of In Progress.